Researchers* from the University of South Carolina, Duke University, University of Alabama at Birmingham, and Metabolon Inc. Research Triangle Park have discovered a new pathway in the liver that opens the door to treat non-alcoholic fatty liver disease, a condition that affects up to 25 percent of the population and may lead to cirrhosis and eventually liver cancer or failure, and likely other liver diseases. The study was published in Free Radical Biology & Medicine, one of the leading scientific journals in the field of oxidative stress and medicine. The team found that an ion channel protein (TRPV4), which can rapidly permeate calcium ions into liver cells where calcium functions as a “switch” inside the cells, which in turn leads to release of a gas, nitric oxide. This gas then blocks one of the liver enzymes (CYP2E1) that is a major contributor to non-alcoholic liver disease and its progression. Nitrous oxide, released by activation of TRPV4 in the liver thus acts hepato-protective, (i.e., shielding the liver from harm caused by excessive action of CYP2E1). 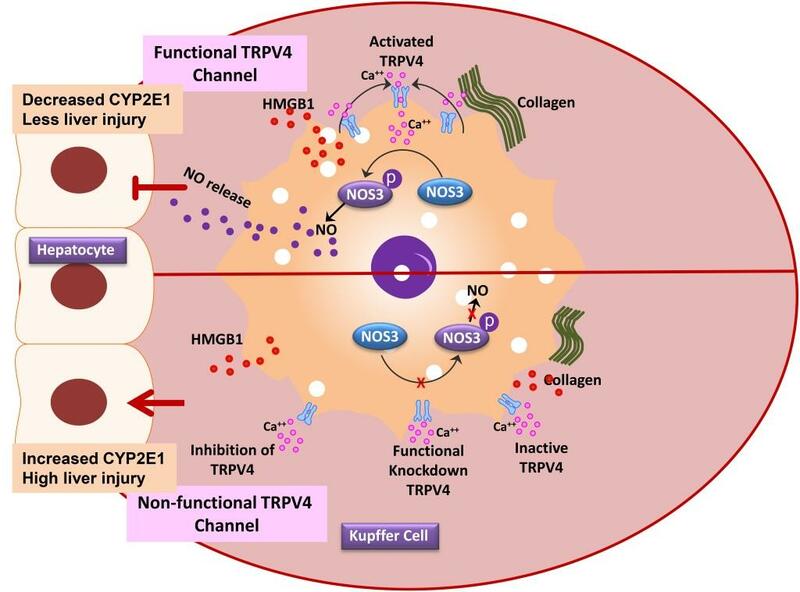 Now that TRPV4’s capacity to block the development of non-alcoholic fatty liver disease has been discovered, the next step is to harness its preventive and treatment perspective. According to the authors, a new generation of TRPV4 activating chemicals or other measures such as gene-therapy will have to be developed and implemented via clinical trials to prevent/treat non-alcoholic fatty liver disease, oftentimes associated with diabesity—a metabolic dysfunction. In addition to revealing the benefits of activating TRPV4, the researchers also warn against the consequences of inhibiting the TRPV4 ion channel, an approach that can enhance hepatotoxicity (i.e., liver damage caused by chemicals), which can result from acetaminophen or alcohol over-consumption. Non-alcoholic fatty liver disease occurs when there is a buildup of extra fat in the liver (i.e., more that 5-10 percent of the liver’s total weight) coupled with liver inflammation that is not caused by alcohol. Affecting both children and adults, this disease tends to occur in individuals who are obese or overweight, have type II diabetes, high cholesterol and triglycerides. However, some people develop non-alcoholic fatty liver disease without any of these risk factors, possibly suggesting genetic risk factors. Healthy liver function is critical because the liver functions as a metabolic and chemical central laboratory in all vertebrate organisms including humans. For example, it processes food and drink into energy and nutrients, produces bile, blood coagulation factors and other blood proteins while processing and removing many harmful substances from blood. *The study was led by Ratanesh Seth, a postdoctoral fellow at the USC Arnold School of Public Health with collaborative inputs from Suvarthi Das (USC Arnold School of Public Health), Diptadip Dattaroy (USC Arnold School of Public Health), Varun Chandrashekaran (USC Arnold School of Public Health), Firas Alhasson (USC Arnold School of Public Health), Gregory Michelotti (Metabolon Inc. Research Triangle Park), Mitzi Nagarkatti (USC School of Medicine), Prakash Nagarkatti (USC School of Medicine), Anna Mae Diehl (Duke University School of Medicine), Darwin P. Bell (University of Alabama at Birmingham), Wolfgang Liedtke (Duke University School of Medicine), Saurabh Chatterjee (USC Arnold School of Public Health, Principal Investigator). Funding: This work has been supported by NIH Pathway to Independence Award, R00ES019875 and P01AT003961 to Saurabh Chatterjee, US Department of Defense (W81XWH-13-1-0299) and a Harrington Discovery Institute (Cleveland OH) Scholar-Innovator Award to Wolfgang Liedtke. R01DK053792 to Anna Mae Diehl, P01AT003961, P20GM103641, R01AT006888, R01ES019313, R01MH094755 and VA Merit Award BX001357 to Mitzi Nagarkatti and Prakash S. Nagarkatti. Nitric oxide released by TRPV4 blocks CYP2E1 and prevents liver injury in non-alcoholic fatty liver disease.